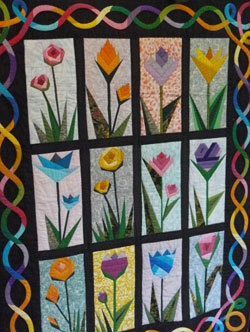 Patchwork is a traditional skill in Sri Lanka. 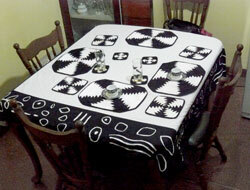 This wall-hanging, as well as the black-and-white table set, was made by a nationally-respected designer and teacher in patchwork who has providd training and advice to women affected by the tsunami, within the framework of the Transrural post-tsunami programme. In November 2006, Transrural staff met tsunami survivors along the coast of Galle district, to discuss their priorities and assess how they were coping with the aftermath of the tsunami and the effects of conflict elsewhere in the country. We also saw for ourselves how well-intentioned support can have unexpected consequences. In one region, we were told how the supply of brand new Nordic shipping boats had resulted in a depletion of fish stocks, because the new boats were so much more efficient that the battered wrecks they replaced. Patchwork is one of the options that the women amongst our target population are trying out in order to restore their livelihoods. Sri Lanka has a long tradition of intricate sewing, based initially on painstaking lacework from before and during the colonial era. In recent times, a textile industry has developed, with factories around Colombo that supply shops such as Marks and Spencer. People in more remote coastal locations are unable to benefit from such development. However, waste material and seconds from the textile industry can be used creatively to make a host of patchwork items. Many women along the tsunami-hit coastal zone already possess basic patchwork skills. What they lack is an understanding of what colour combinations, designs and products might sell - to tourists, in the capital Colombo, or via Fair Trade outlets. 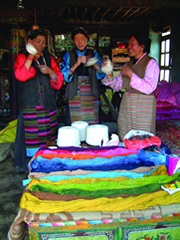 They also need assistance in developing links to, and negotiating with, suppliers of raw material; help in organising effective community-based enterprises; training in special techniques and quality control; and small grants to match their own savings for buying sewing machines. Perhaps most importantly, they need ready access to design input and to marketing opportunities. The number of possible colour combinations and product types is virtually endless. Perhaps patchwork duvets, cushion covers or snake-shaped door stops will hit that market niche. The design and test marketing inputs should tell us that. From 2010-12, Transrural is channelling support to an estimated 300 “beneficiaries”, by building up the capacity and accountability of the Shoba Life to Hands Women’s Cooperative Society that is based in Galle, south-western Sri Lanka (see www.shobafashion.org). Constituent women’s groups in the Society are focusing their hand skills and energies on making bags, bed quilts, patchwork, ethical clothing, kitchenware, lace products and table linen.